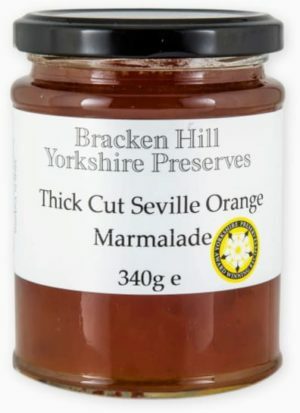 A sharp, fresh Seville orange coarse-cut marmalade. Winner of the ‘Silver Award’ at the Great Taste Awards. Sugar, Seville Oranges 55%, Lemon Juice (From Concentrate), Citric Acid, (Prepared with 56g Fruit per 100g. Total sugar content 66g per 100g).